During the 1930s, The New York Times carried an article by a Portland-based correspondent named Richard L. Neuberger. The author - who had attended the University of Oregon, but left without a degree - would become the most prolific freelance writer in America and Oregon's U.S. senator. One of Neuberger's devices was to invent a stock character who would make a point. One of these was an Indian. In Neuberger's dispatch about the genesis of Bonneville Dam, the Indian said: "White man's dams mean no more salmon." As crudely drawn as Neuberger's mouthpiece was, his national article was one of the few analyses that presaged what we have come to know as the decimation of the salmon population of the Columbia River. One could say that the cause-and-effect relationship that Neuberger identified is the most fundamental element in Pacific Northwest ecology. By turning the Columbia River into an industrial machine - aptly described in Blaine Harden's book A River Lost: The Life and Death of the Columbia. Northwest members of Congress and the Army Corps of Engineers gave a lobotomy to one of nature's most basic processes of renewal. We have spent millions compensating for the mortgage placed on the Columbia and its tributaries. On Wednesday, there was an event on the White Salmon River of great consequence. A megadose of dynamite blew up the Condit Dam. 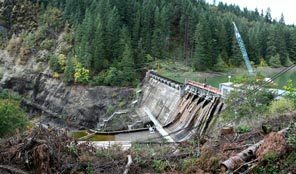 The Register-Guard of Eugene described the Condit as one of many dams that are "diabolically efficient fish killers." Other dam removals preceded the Condit deconstruction and more will follow. All of this is unalloyed good news for the environment. The Register-Guard dampens expectations that the Snake River dams will eventually meet that fate. That is the safe bet. We would not rush to that judgment. If this century does not become an environmental moment, the human race will pay dearly. Opening rivers and streams to their original capacity will make them healthier and boost fish populations. It's all about habitat. Someday soon, even the thick skulls that deny global warming will recognize that it's about our habitat.